With selective ion radiation the transition temperature in vanadium dioxide is altered in regions affected by the ion beam. 18-Jan-2016: Now you see it, now you don’t: In books and movies, wizards use magic spells to easily change things from a solid to see-through state. However, in reality, materials with properties called phase transition can pull off a similar trick, changing from clear to cloudy depending on the temperature or an applied electric field. Recently, a multi-institutional international team of researchers with the participation of physicists from the Friedrich Schiller University Jena (Germany) developed a way to engineer the transition point for the phase-transition material vanadium dioxide to occur at specific temperatures. The research, published today in Nano Letters, could lead to new types of tunable materials for optics and thermal regulation. “Essentially, any optical component would be better if it were tunable,” says Mikhail Kats, a University of Wisonsin-Madison (USA) assistant professor of electrical and computer engineering and senior author of the paper. Rather than relying on mechanical components to focus an object such as a camera lens or telescope eyepiece, a tunable material changes its innate optical properties on demand. Scientists have known for more than 50 years that substances like vanadium dioxide can transition between opaque and transparent. However, these materials typically switch under only one particular set of conditions, limiting their applicability. 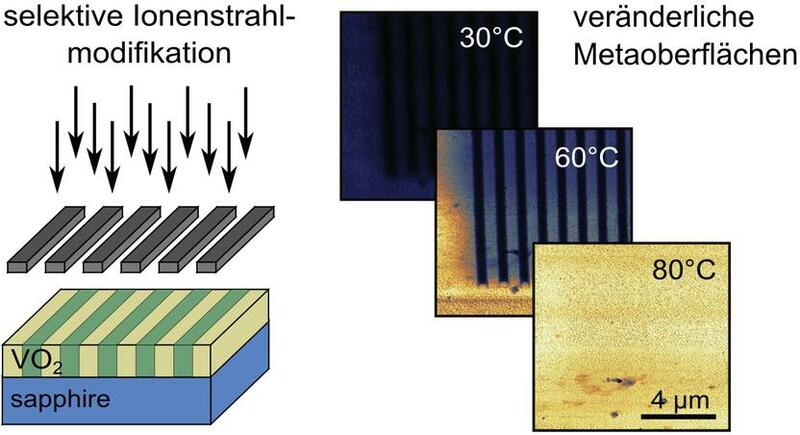 “In most phase-transition materials, the change occurs at conditions that are far from room temperature, and thus are difficult to incorporate into useful devices,” says Kats. The researchers not only changed vanadium dioxide’s intrinsic shift point from 68 degrees Celsius to below room temperature, they also successfully tuned the transition for that material to any temperature. “This finding is going to open new frontiers in photonic devices,” says Shriram Ramanathan, a professor of materials engineering at Purdue University in West Lafayette, Indiana (USA), who also contributed to the research. Because optical and physical properties arise from the same underlying physical principles, vanadium dioxide’s thermal and electrical conductivities also shift with the transition. These types of materials could be used, for example, in homes as “smart” walls or windows that respond to the environment. “Objects designed to emit light efficiently at high temperatures but not at low temperatures could be used as purely passive temperature regulators that do not require external circuitry or power sources,” Kats says. Previously, researchers attempting to change the transition temperatures of vanadium dioxide always introduced impurities as they created it. However, this method uniformly alters the material’s entire surface – so instead, the German-American team of researchers bombarded specific regions of the vanadium dioxide with energetic ions. Ion irradiation creates defects in materials, usually an unintended side effect. However, collaborator Carsten Ronning of the Friedrich Schiller University Jena, Germany, explains, the researchers’ advance now capitalizes on those defects. “The beauty in our approach is that we take advantage of the ‘unwanted’ defects,” he says. Directing the ion-beam at specific regions of a surface allowed the researchers to make nanoscale modifications to the material. “We can precisely control the transition temperature everywhere on the sample, with roughly 20-nanometre precision,” Ronning states. “We have been able to use this method to create highly effective meta-surface areas which have multiple phase transitions at the same time.” This technique enabled the researchers to design and create a novel optical polariser that changes selectivity based on temperature.